The debate we aren't having about a murder in Oklahoma. Three teenagers were charged Tuesday in the killing of a white college student in Duncan, Oklahoma, and part of the story is what didn't happen. There was no saturation cable TV coverage, no press conference featuring Al Sharpton or Jesse Jackson, and no statement from the Oval Office. 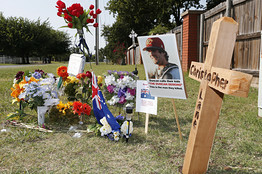 The death of Christopher Lane, while as troubling as that of Trayvon Martin, will not become a national touchstone of racial and cultural debate or reflection. But maybe it should. A 22-year-old Australian from Melbourne, Lane was attending East Central University in Ada, Oklahoma, to pursue his dream of playing that American pastime, baseball. He was visiting the parents of his girlfriend in Duncan after the two had recently returned from visiting Australia. Lane was jogging down a street on Friday evening when, according to prosecutors, he was shot in the back. Police chief Dan Ford said that 17-year-old Michael Dewayne Jones, who drove the car and was charged with accessory to murder after the fact, told police that the three boys were bored and had killed Lane for "the fun of it." Prosecutor Jason Hicks said 16-year-old Chancey Allen Luna was sitting in the rear of the car when he fired a .22 caliber revolver and killed Lane. There won't be any debate over "stand your ground" laws or self-defense in this case because Lane had no chance to defend himself. There is no evidence so far of a racial motive. Lane seems to have been shot simply because he was there. The murder is a national story in Australia, where people are contemplating the horror of such casual killing in America. Some are focusing on the ease of obtaining a gun in the U.S., as (inevitably) is the reflexive CNN, and it would almost be a relief if we could blame such a murder on guns. Then we wouldn't have to focus on a culture that produces teenagers for whom the prospect of shooting an innocent man in the back on a Friday evening apparently raised not a scintilla of conscience. That is the deeper tragedy, and the real scandal, of too much of American life. That is also an issue of far greater consequence to the future of young black men than the acquittal of George Zimmerman in his awful showdown with Trayvon. If only Mr. Sharpton and his fellow black leaders paid attention to what was missing in the lives of those three teenagers. Maybe President Obama would even care to use it as one of his teachable moments.